This morning, running late, I parked a little bit close to the entrance to someone’s front drive. I admit; I was in the wrong. No doubt, I was infringing on their personal space and it was probably slightly infuriating that a school run mum was taking liberties and using the cul-de-sac as a freebie car-park. As I was unloading my brood from the car, the owner of the house came out and stood on the porch; and started taking photos of me on her camera. I was slightly flabbergasted! I asked her – ‘do you have a problem with me parking here?’ Clearly she did; however she didn’t answer but shot me a withering look whilst simultaneously snapping further pictures of me, the car and the children, before slamming her front door and going back indoors. Possibly she felt that words were ineffective. Maybe I had not been the first offender. Anyway, once the morning rush was over, I was left with my thoughts about the incident. I realised that I was more upset by the fact that this person was not able to tell me directly that she had a problem with me. It felt like quite an aggressive and attacking response to start photographing us without even attempting a dialogue or some form of communication. But I was also aware, that there were probably some very good reasons why she didn’t. Maybe she is not used to being heard when directly communicating her feelings. Maybe she expected me to retaliate and be hostile. Maybe she didn’t want to express any vulnerability in case I was attacking back? This might have felt very unsafe. And sadly this is not an isolated incident. At Lego Land recently, I watched in horror as a father at the front of the one hour queue for a water-ride, completely ‘lost it’ in an aggressive and abusive rant towards the staff. He was shouting, abusive, loud, intimidating. He clearly felt upset about an incident with his child and he may well have been right in feeling angry. Upset, disappointment, sadness, humiliation may all have been under this anger, but he probably didn’t deal with it in the best way to achieve his desired outcome for himself and his children. I would guess though, that again, he was doing the best he could and didn’t have other strategies for managing his anger differently. And whilst I point the finger, I am well aware that I have much to learn in anger management. For much of my earlier life, I was quite effective (or so I thought!) in denying that anger was a feeling that even crossed my emotional radar. Of course, everything was just fine and no it didn’t really matter if my needs had been completely squashed – not! However, my anger would leak out in all kinds of other ways. Snide comments, stomping around; ignoring the ‘offending party’; eating to name a few. I was taught early on that expressing anger was ‘not the thing to do’. Rather be a good girl and please others. And there is none as furious as the one who is trying to continuously maintain this façade, trust me! The problem is not the feeling of anger but how we manage it. Anger is a normal emotion that we can ALL feel at different times and can vary in its intensity from mild irritation to outright fury. Feeling angry can be helpful as it is normally a reaction to a perceived threat or a warning siren within us to signal that something is wrong. Used well, anger can help us to stand up for ourselves and motivate us to correct injustices. It can also motivate and drive us to make positive changes to situations. To manage anger effectively, this requires an ASSERTIVE response - expressing your needs in a clear and calm manner, whilst also holding a degree of sensitivity and understanding for the other person’s position/viewpoint. It takes practice. ‘Losing your rag’ and becoming loud, aggressive and intimidating. Pushing anger away and pretending that everything is okay, but secretly feeling cross and walked over. Not recognising your anger. Maybe becoming flooded and overwhelmed with emotions so it is hard to articulate how you feel. Using food or attacking your body when feeling angry. Seeing the other person’s point of view too readily and then giving in, but still feeling upset. Feeling guilty for expressing your point of view as you feel sorry for the other person, so bottling things up. Count to ten before you respond to a situation. This may involve getting some air or space away for a few minutes. Stand tall; deep breath; speak slowly and purposely. Practise I feel statements so you take responsibility for your emotional state rather than blaming. Eg: instead of ‘you always let me down’; say ‘I feel disappointed when you don’t commit to things you said you would do’. If someone doesn’t listen, use the broken record technique and keep affirming your point of view. If you don’t know how you feel, give yourself some space first. Let the flooding of emotion subside. As you try to be more assertive, start with the little things that don’t matter as much. Expect the pendulum to swing both ways between a passive and an aggressive stance until you master the art of assertive communication. It is really okay to say NO. People actually like to know where they stand rather than there being a feeling of ambiguity. When people say yes and mean no, you can often sense the underlying resentment or you get a feeling of unease around the interaction. 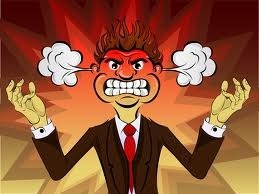 If you would like to share your own experiences of your personal journey in managing your anger, please do post below. If you would like to get in touch about working with me to explore some of these issues further, I would love to hear from you. I am passionate about helping you to eat all the foods you love; and feel great about your body without disordered eating or dieting.